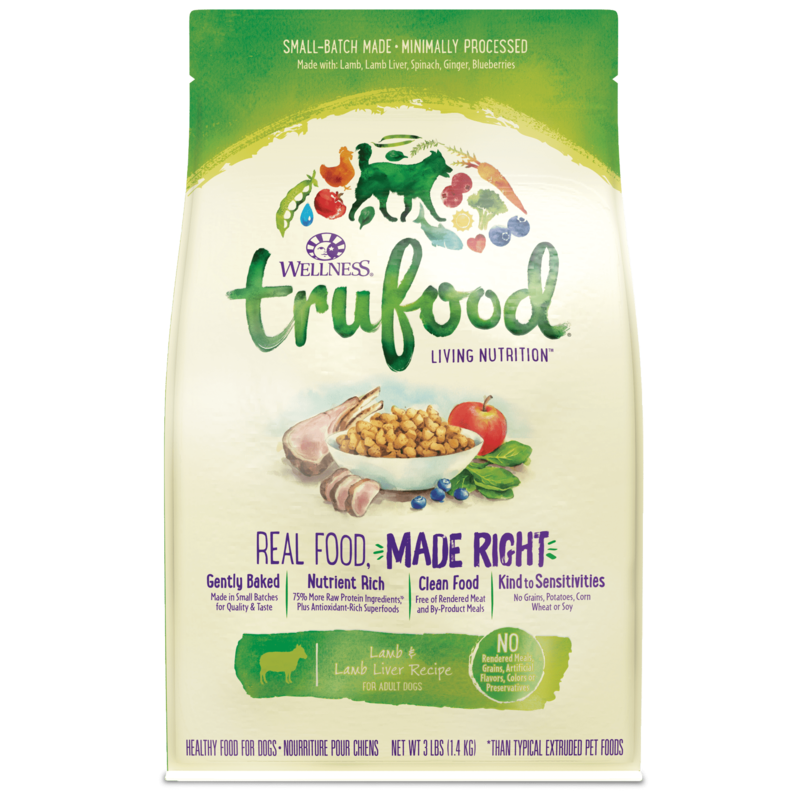 OUR INGREDIENTS: Chicken, Chickpeas, Lentils, Pea Protein, Chicken Liver, Chicken Hearts, Flaxseed, Tomato Pomace, Chicken Fat, Calcium Carbonate, Dicalcium Phosphate, Natural Flavor, Choline Chloride, Salt, Vitamin E Supplement, Zinc Proteinate, Spinach, Ginger, Glucosamine Hydrochloride, Mixed Tocopherols added to preserve freshness, Broccoli, Chondroitin Sulfate, Parsley, Blueberries, Kale, Purple Carrots, Niacin, Apples, Iron Proteinate, Copper Proteinate, Thiamine Mononitrate, d-Calcium Pantothenate, Vitamin A Supplement, Biotin, Pyridoxine Hydrochloride, Riboflavin, Vitamin D3 Supplement, Manganese Proteinate, Inulin, Yucca Schidigera Extract, Sodium Selenite, Folic Acid, Calcium Iodate, Dried Lactobacillus plantarum Fermentation Product, Dried Enterococcus faecium Fermentation Product, Dried Lactobacillus casei Fermentation Product, Dried Lactobacillus acidophilus Fermentation Product, Rosemary Extract, Green Tea Extract, Spearmint Extract. 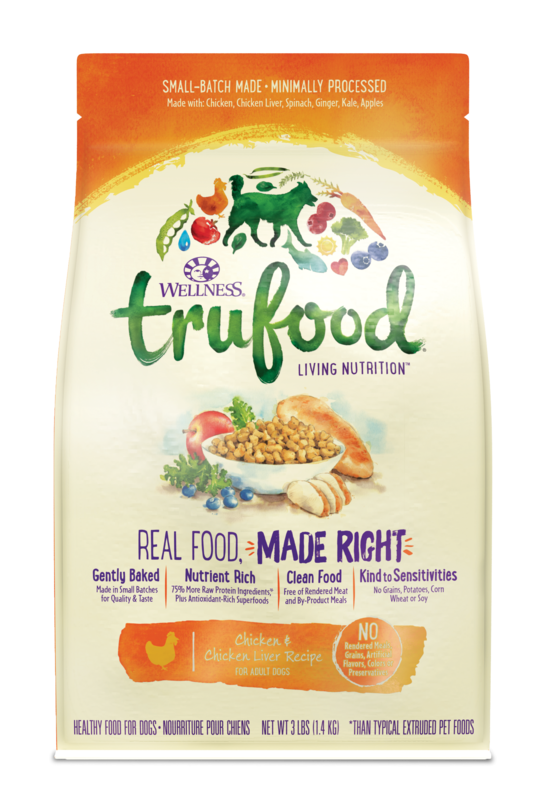 TruFood Adult Dog Chicken & Chicken Liver Recipe is formulated to meet the nutritional levels established by the AAFCO Dog Food Nutrient Profiles for maintenance. 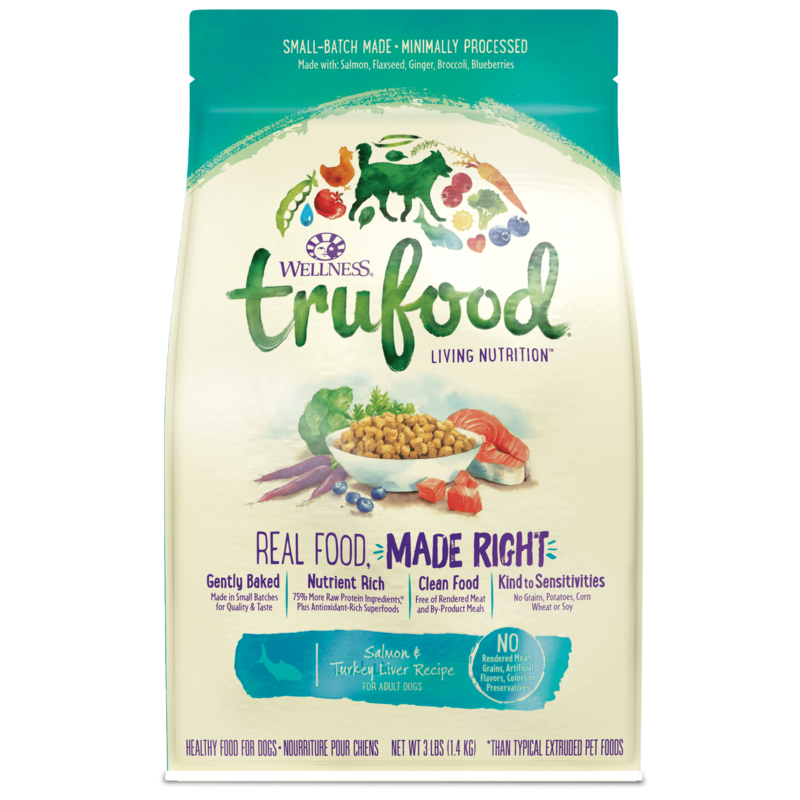 If feeding with Wellness wet food, reduce dry amount by ⅓ cup (34g) for every 6 oz (170g) of wet food. This food contains 3,694 kcal/kg or 377 kcal/cup ME (metabolizable energy) on an as fed basis.